Premier Tickets is proud to be the online ticketing partner for Baba Ramdev’s Yoga Camp Australia 2015. 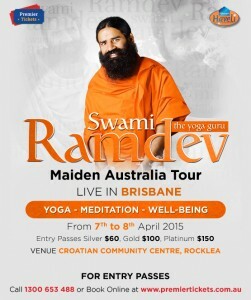 Swami Ramdev is visiting Australia for the first time and will be imparting Yoga sessions to live audience in Brisbane on 7th and 8th April 2015 at the Crotian Community Centre, Rocklea. Come, experience the magic and rejuvenate yourself with Yoga! Baba Ramdev’s Yoga consists of a set of various breathing exercises (PRANAYAMA) along with a set of simple yoga postures (ASANAS) that can help practitioners achieve healthy body as well as controlling diverse ailments in the body. Pranayamas are a collection of breathing exercises that concentrate on increasing oxygen level in the blood and improving oxygen flow to all body parts. 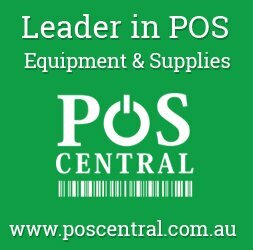 This in turn positively impacts the overall health of the individual. All these when practiced regularly are known to improve overall health of an individual. Baba Ramdev’s Pranayama exercises are very simple to perform and each of these require barely 8- 10 minutes. Baba Ramdev’s Meditation or Dhyan Yog helps you connect to your core. We humans are never at peace with ourselves in this fast-paced world and our reckless lifestyle is causing immense harm to our health. Swami Ramdev-ji explains various meditation techniques and explains ways to lead our life in a way that offers complete peace & relaxation. 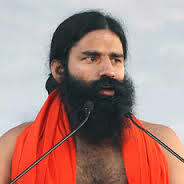 Baba Ramdev also imparts lecture on good eating and sleeping habits, weight loss and control, prevention and control of various chronic life style diseases as blood pressure, diabetes , thyroid and more. All participants will be responsible for obtaining consent from their doctor before participating in the yoga sessions. Suitable clothing is advised; Women are advised to wear white/yellow/pink salwar-kameez or gym wear and Men are requested to wear kurta pyjamas or loose gym wear/jogging wear. All participants will be required to display passes to gain entry into the workshops. We strongly advise for all participants to be medically examined before and after the workshop whereby they can analyse the benefits. For health and safety reasons children under the age of 10 are not encouraged to attend the Workshop and will be allowed in only if under strict parental guidance and supervision and at the parents’ own risk and responsibility. Participants are strongly advised to come in the morning after completing the morning ablutions and on an empty stomach for maximum results. Participants in the evening session must not eat/drink anything for around 3/4 hours before attending the Workshop. The Organizers & Instructors (‘O&l’) which expression shall include all related entities, employees. agents, affiliates, volunteers associated with them expressly state that in general Yoga is safe and beneficial but like any other health program it needs to be practiced judiciously, correctly and cautiously. No citing by O&l at the Yoga Workshop to any health-related/medical/other information is intended to be a substitute for professional judgment of a qualified health-care provider. The O&l are not subject or liable to change the structure of the Yoga Workshop to suit individual needs. Not all presentations at the Yoga Workshop may be suitable for everyone. If pain is experienced anytime during the practice of Yoga, it should be stopped immediately and a qualified health care professional should be consulted. The 0&I assume no responsibility and will not be liable for any harm, injury or damage resulting from any tort, negligence or from a breach of an express or implied warranty however caused or occurring during or after participation in the Yoga Workshop or while practicing anything presented therein. By participating in the Yoga Workshop the participant, for himself/herself, his/her heirs, and assigns, hereby expressly assumes all risks, full responsibility and liability for participating and practicing anything presented therein and forever waives and releases and agrees to defend, indemnify and hold the O&l harmless from and against any and all claims or demands, liabilities and settlements (including without limitation, legal and accounting fees) on or against the O&l for losses or damages, including, without limitation, direct, indirect, incidental, consequential or special damages, personal injury/wrongful death, resulting from or alleged to result from participating in or practicing anything that is presented in the Yoga Workshop. The 0&l, at their sole own discretion reserve the right to deny participation at any time of the Yoga Workshop to any entity without assigning any reason whatsoever.